This model is available as an automated tutorial by selecting Model Examples and Tutorials... > Electromagnetics > Two Material Wave Guide Interface from the File menu. Or alternatively, follow the step-by-step instructions below. Enter A into the Dependent Variable Names edit field. The geometry consists of two rectangles for the different materials. Enter -0.12 into the xmin edit field. Enter -0.01 into the ymin edit field. Enter 0.01 into the ymax edit field. Enter 0.12 0 into the Space separated string of displacement lengths edit field. 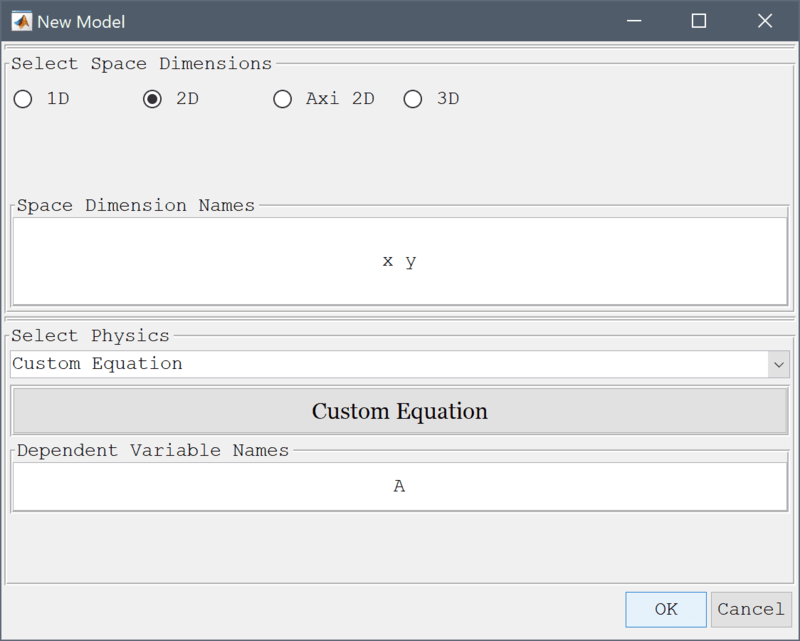 Enter the Helmholtz equation in the Edit Equations dialog box. Enter -(Ax_x + Ay_y) - k^2*A_t = 0 into the Equation for A edit field. Press the Constants Toolbar button, or select the corresponding entry from the Equation menu, and add the following modeling constants for the speed of light, frequency, and wave number in the Model Constants and Expressions dialog box. Note that the wave number is scaled by a factor of two in the left subdomain (entering a space separated list allows prescribing constants on a per subdomain basis). Set homogenous Dirichlet conditions A = 0 for the absorbing walls. An incoming planar wave is featured at the inlet with the complex boundary condition n·∇(A) + k·i·A = 2·k·i which can be implemented as a Neumann boundary condition. Select boundary number 5 in the Boundaries list box. Select the Neumann, g_A radio button. Enter -k*i*A + 2*k*i into the Dirichlet/Neumann coefficient edit field. The outlet is assumed non-reflective and n·∇(A) + k·i·A = 0. Select number 3 in the Boundaries list box. Enter -k*i*A into the Dirichlet/Neumann coefficient edit field. 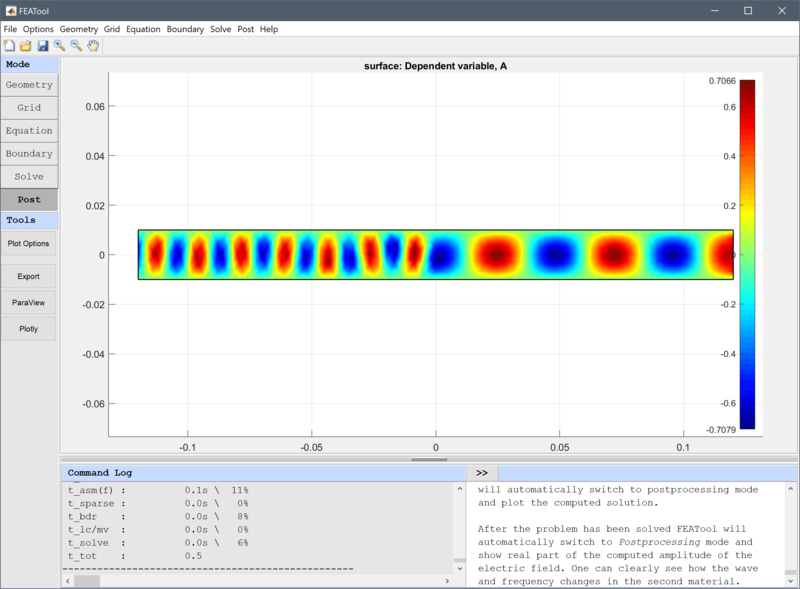 After the problem has been solved FEATool will automatically switch to Postprocessing mode and show real part of the computed amplitude of the electric field. One can clearly see how the wave and frequency changes in the second material. The two material wave guide interface electromagnetics model has now been completed and can be saved as a binary (.fea) model file, or exported as a programmable MATLAB m-script text file, or GUI script (.fes) file.